The WordPress stats tell me there is still a lot of interest in our previous post on integrating OpenLayers and HTML5 Canvas from way back in 2010. Time has passed, technology has moved on and I’ve started buying shoes in bulk like Mr Magorium. So below, I provide an update on how I integrate OL and HTML5 Canvas 3 years on. Previously my approach was to replace each individual tile image with a corresponding canvas element, the same size as the tile (typically 256*256). Also we used JQuery to capture tile rendering events. The updated approach is to capture tile images as they are rendered by OpenLayers using OL built in event listeners and then draw these onto a single HTML5 canvas element. Apart from being more efficient and producing cleaner, more robust code, this approach has the advantage that you can use HTML5 to draw shapes, lines and manipulate pixels on a single canvas tile, crossing tile boundaries. This is particularly useful for drawing lines and shapes using paths (e.g. lineTo() , moveTo() functions). 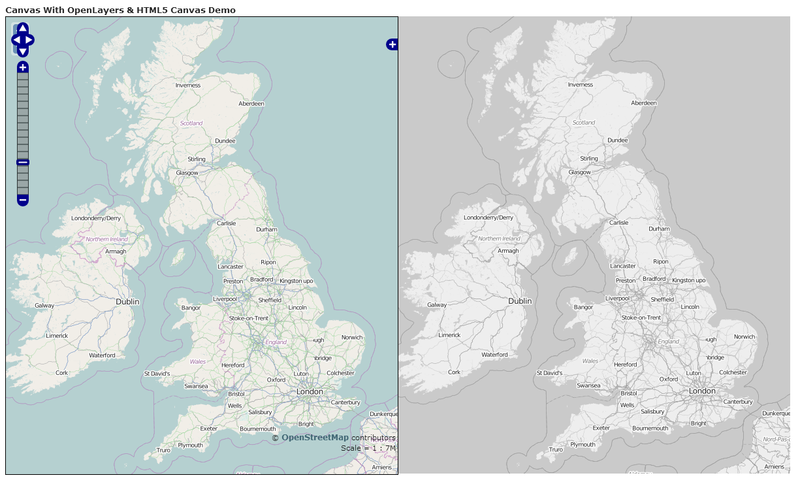 To demonstrate this I’ve set up a simple demo that shows the HTML5 Canvas adjacent to a simple OpenLayers map, where the canvas version (on the right hand side) is manipulated to show a grayscale and inverted version of the original map image (grayscale is triggered by loadend and the invert function by moveend) The source code is available on EDINAs gitHub page. (https://github.com/edina/geomobile) and on JS Fiddle page. // register loadend event for the layer so that once OL has loaded all tiles we can redraw them on the canvas. Triggered by zooming and page refresh. Note that some of the code here comes with a health warning. The DOM functions used to navigate the OpenLayers hierarchy is susceptible to changes in the Open Layers API so you need to use a local copy of OpenLayers (as is case in GitHub sample) rather than point to the OpenLayers URL (as is case in the JS Fiddle version). Also note that all layers are drawn to the Canvas, not just the one that Open Layers triggered the loadend event for. This is necessary to ensure that the order of layers is maintained. Another issue to be aware of when using Canvas drawing methods on maps is the likelihood of a CrossOrigin tainting error. This is due to map images being loaded from a different domain to that of the HTML5 code. The error will not get triggered simply by drawing the tiles to canvas using the drawImage() function, but does fail when you attempt pixel manipulation using functions such as putImageData() . OpenLayers handles this using the Cross-Origin-Resource-Sharing protocol which by default is set to ‘anonymous’ as below. So long as the map server you are pointing to is configured to handle CORS requests from anonymous sources you will be fine. Would be interested to hear if others are doing similar or have other solutions to doing Canvasy things with OpenLayers.